The idea of the Football Weekend was born in in the Autumn of 2005 when family friend Theo de Reus invited myself and my Dad to his home in Duiven, with the purpose of spending the weekend with him, watching some football and having a few beers, as lads do when they are together. That weekend in the October saw us take in games at Ajax, NEC Nijmegen and Vitesse Arnhem, it was a cracking weekend and we vowed to do it again the following year, which we did, massing four games this time round, adding to De Graafschap and Schalke 04 to the list. The theme continued and over the years the weekend has effectively stretched to a full week, with the record for a trip containing seven games in 2014, but typically now it would be five or six games as a minimum. So what have been the footballing highlights? Trips to Germany have always been great fun, Schalke, Borussia Dortmund, Borussia Monchengladbach and FC Cologne being the most memorable, whereas in Holland you can’t help but be impressed by the intensity of a big game at De Kuip when Feyenoord are at home. The Spakenburg Derby was not an event to forget either, as was a trip to watch Go Ahead Eagles for the special atmosphere the fans of Deventer create. It’s not always been about big games though, Theo’s local club DVV was always a great afternoon out, one whereby you would rarely return sober such was the hospitality shown towards their friends from England. VFL Osnabruck, from the twin town of Derby, was a great experience as was MSV Duisburg, however, as we were about to embark on our thirteenth successive year of football weekends, one venue stands out for me, and that is the Westfallenstadion (or Signal Iduna Park), home to the mighty Borussia Dortmund. 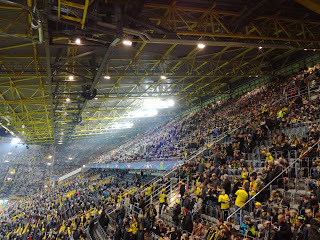 We first went to BVB in 2007, to see them play Eintracht Frankfurt in a Bundesliga game, I wasn’t sure what to expect at the time, but I was simply blown away by the stadium, the atmosphere, and the occasion itself, which I feel is unique to football in Germany. I have been desperate to get back since then, and I’ve followed the clubs fortunes over that time. Finally last season an opportunity presented itself when their Champions League game against Legia Warsaw fell perfectly. The game finished 8-4, it was truly remarkable, and in terms of rekindling memories, it was everything I’d hoped for. The fixtures fell kindly again, this time against Tottenham Hotspur, scheduled for the day we arrived in Holland. 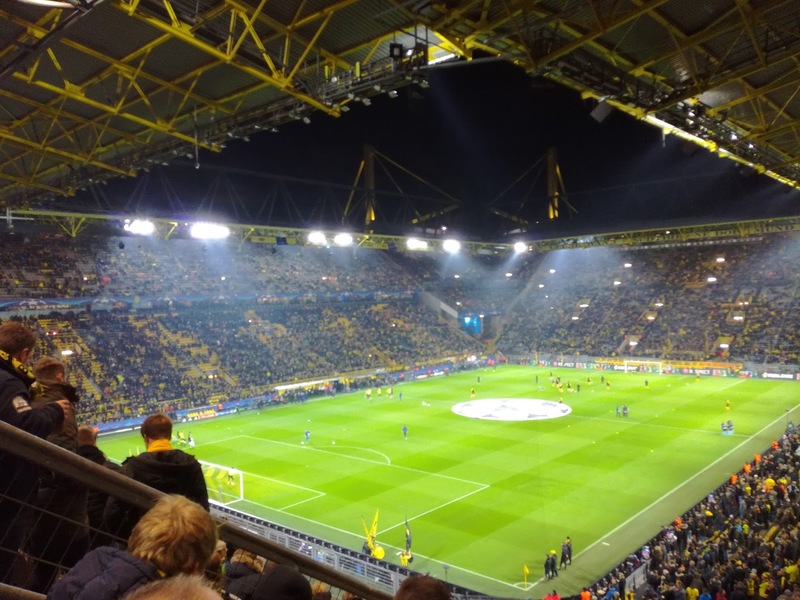 Tickets were secured by Theo well in advance, so the chance to watch an English team in Dortmund was going to be something special, especially considering Spurs are young Master Hatt’s favourite team! The logistics were simple, we flew into Amsterdam and then got the train via Arnhem to Duiven, where our chauffeur was waiting for us, Edwin, the owner of the excellent Een Mooie Dag restaurant in the town, where we were treated to a superb lunch pre departure. 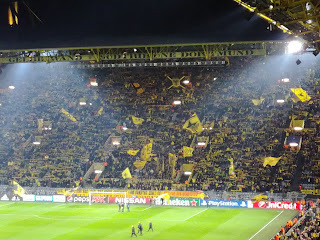 Dortmund is around an hour and twenty minutes from Duiven and in double quick time we were in the car park located right next to the ground. 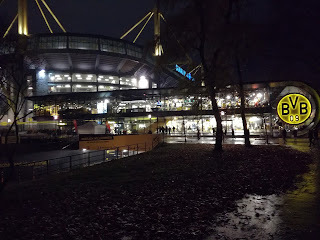 After purchasing obligatory souvenirs, we made our way to the Strobels bar which sits on the North East corner of the stadium, a venue we have spent considerable time in on our previous visits. 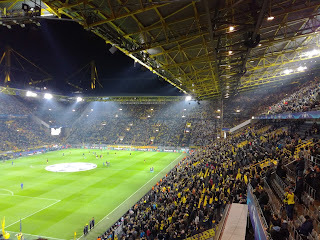 With plenty of time on our side we took up seats at the bar and soaked up the atmosphere as Spurs and Dortmund fans mingled in the bar and sang songs. This is the beauty of German football for me, the culture is one of togetherness, celebration and enjoyment. 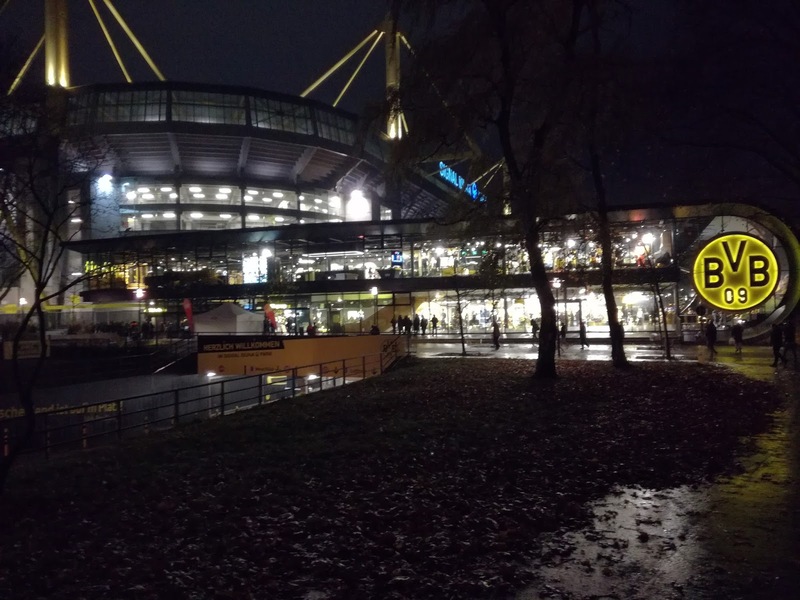 Fans arrive at the grounds ridiculously early, but that is because of the atmosphere, the beer and the bratwurst, and at the same time the Police, while visible, are low key, they don’t herd supporters around, and as a result the atmosphere is boisterous but never threatening. This has helped to create a family feel to the day out, and with the pricing structure sensible, is it any wonder the stadiums in the Bundesliga are regularly sold out? 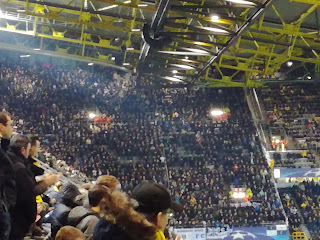 With numerous German lagers inside us, we made our way to the seats which were in the nearby North West corner, almost directly over the corner flag, half way up the stand. 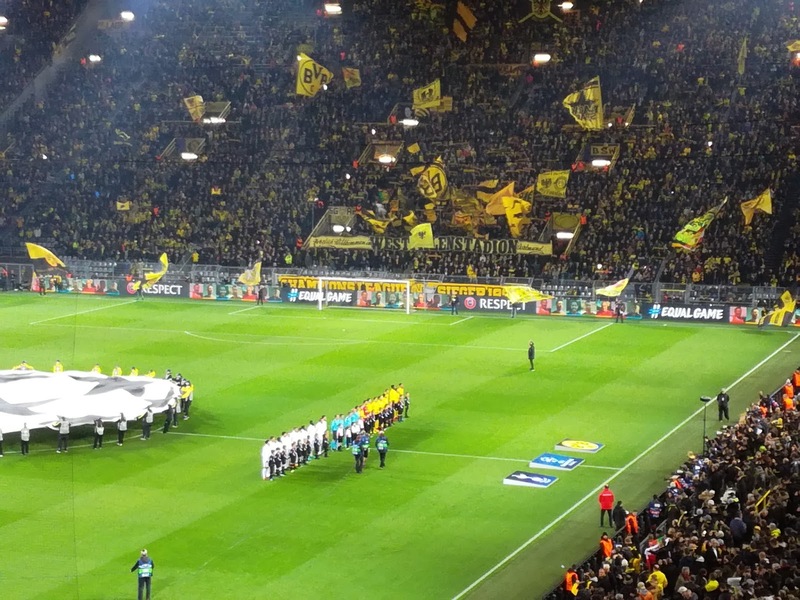 The atmosphere was again, amazing, and the Dortmund version of “You’ll Never Walk Alone” is very special indeed. 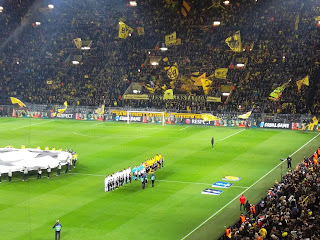 Sadly for Dortmund though, they are not the side they were under Jurgen Klopp or Thomas Tuchel. Dutchman Peter Bosz has lead them to a top five place in the league this season, they won’t win it, and they certainly won’t be going any further in the Champions League. Pierre-Emerick Aubameyang gave the hosts the lead but a confident Spurs side, who seemed to be playing within themselves, came out of the traps with more purpose in the second period. Harry Kane finished well before great work from Dele Alli set up Son Heung-Min to put the ball into the top corner. Spurs were comfortable at this stage, Dortmund were out of ideas, they simply weren’t good enough, and sadly, to be in that position of not being good enough, is not where they should be. It’s the Europa League or bust for Dortmund now, and after drawing 4-4 with Schalke a few days later after being 4-0 up, the knives are out for Peter Bosz. But, the crowds continue to turn out in huge numbers, the Sudtribune remains one of the most impressive sights in football on a matchday with the colour and the noise, and with a restricted 65,000 in the ground for the Spurs game and then close to 85,000 attending league games, this is a support base that deserves better than they are currently getting. The exit from the car park was quite straightforward, and pretty soon we were on the motorway, with a stash of beer, sausage and cheese to accompany us on the journey back. The Football Weekend was truly underway, and we’ll never tire of our trips to Dortmund, which for me is the best football day out you can experience, bar none. If you get the chance to visit, grab it with both hands, my words barely do it justice, it has to be simply experienced for yourself.